County Fermanagh is a largely rural county in the south-west of Northern Ireland and is famed for its numerous lakes. 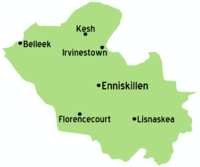 County Fermanagh belongs to the province of Ulster and is one of the six counties that form Northern Ireland. It is Northern Ireland’s western most county and covers an area of 1,691 km². Its capital is Enniskillen housing the tourist attractions Enniskillen Castle, Cole's Monument, the Ardhowen Theatre and St. Macartin's Cathedral. County Fermanagh is a rural area and therefore agriculture and tourism are the most important industries. The agricultural land is mainly used for hay and grazing than for other crops. The two lakes Upper Lough Erne and Lower Lough Erne are separated by the county's capital and linked to the river Shannon. Tourists may visit the Belleek Pottery, the oldest pottery in Ireland producing the finest china. Other places of interest are Necarne Castle, Florence Court, the Marble Arch Caves, Loughnavar Forest Park. There are three main airports in Northern Ireland. Both Belfast International and Belfast City Airport are a 2 hour drive away and City of Derry Airport is 1 hour 45 minutes away. Dublin airport is about 2 and a half hour drive from Fermanagh and many like to combine seeing both the beauty and culture of both Southern as well as Northern Ireland. If you have a private plane you could arange a landing at St. Angelo's Airport in Trory, just outside Enniskillen. Many travellers from the UK like to avail of the frequent ferry services operating between Britain and Northern Ireland. Belfast Port and the ferry into Larne are popular points of entry. Many like the freedom of self drive tours of Northern Ireland. AA Route Planner is a good resource for planning your travel routes. You drive on the left hand side of the well maintained roads in Northern Ireland. Pound Sterling £ is the local currency. You would look at spending about £5-£7 on "pub grub" for lunch in a bar. Budget for about £20 for a main course meal in a mid price restaurant in the evenings. Their are a number of high quality B&Bs/family run guesthouses in Fermanagh to select from. Expect to pay around £20-30 per person on average. With over 58 properties on offer this is the preferred method of accommodation for most visiting Fermanagh looking for value. For those on a budget, hostels are a cheaper option but have less coverage than B&Bs. There are only 4 hostels - The Bridges Youth Hostel, Lough Melvin Holiday Centre, Tir Navar and Share Centre. There are only about 11 hotels operating in Fermanagh, ranging from 2 to 5 star. For groups and larger families there are over 180 self catering choices on offer so you will be spoilt for choice. You be surprised to hear that Fermanagh has the second lowest crime rate in Europe. Even during the height of the "troubles" and civil rights movement Fermanagh tourist attractions were hardly affected. The unrest of the 70s and 80s have become a thing of the past in recent years. This page was last edited on 26 March 2019, at 08:37.